Deborah Agler’s key responsibility is directing the grants process for the Regional Partnership. As part of the strategic funding team, she manages foundation relationships, research, and grant proposal development and implementation. 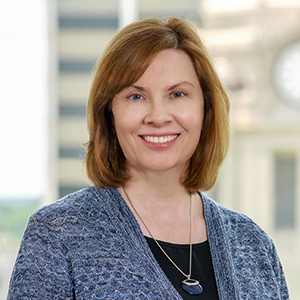 Before joining the Regional Partnership in February 2018, Deb built her career in communications management and teaching as a university professor for Taylor University and as an adjunct at Indiana University-Purdue University Fort Wayne (IPFW). She is a graduate of Ball State University, the University of Saint Francis and Purdue University, where she earned her master’s degree. Born and raised in Northeast Indiana, Deb loves the beauty and variety of each Hoosier season. Yes, that includes our cold, snowy winters! Deb has written one nonfiction book and one novel, and has been published in three Chicken Soup for the Soul books. She thinks both dogs and cats are wonderful. Her greatest joy is spending time with her family, and she’ll gladly bake their favorite pies, peach cream and apple streusel, any time they ask!